Go-Set was the first Australian pop music newspaper, published weekly from 2 February 1966 to 24 August 1974, and was founded in Melbourne by Phillip Frazer, Peter Raphael and Tony Schauble. Widely described as a pop music "bible", it became an influential publication, introduced the first national pop record charts and featured many notable contributors including fashion designer Prue Acton, journalist Lily Brett, rock writer / band manager Vince Lovegrove, music commentator Ian Meldrum, rock writer / music historian Ed Nimmervoll and radio DJ Stan Rofe. It spawned the original Australian edition of Rolling Stone magazine in late 1972. David Kent is an Australian music historian and pop culture writer. Kent produced the Kent Music Report, compiling the national music chart from May 1974 to 1996; it was known as the Australian Music Report from 1987. The music reports were a weekly listing of the National Top 100 chart positions of singles and albums. 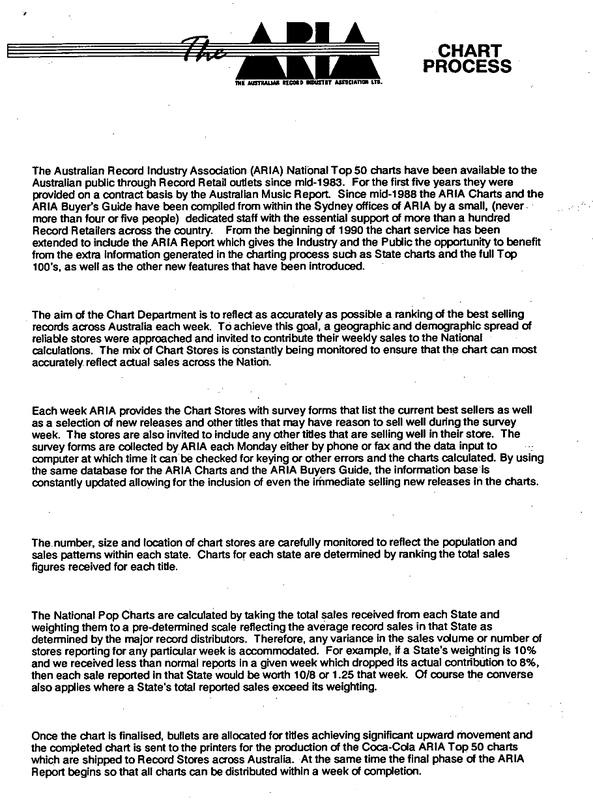 Kent's music reports were used by Australian Recording Industry Association (ARIA) as its official ARIA Charts from mid-1983 until July 1988 when ARIA developed an in-house chart. Underworld are a Welsh electronic group, and principal name under which duo Karl Hyde and Rick Smith have recorded together since 1983, though they have also worked together under various names both before and after adopting the Underworld moniker. The band is perhaps best known for "Born Slippy .NUXX", a track made popular in the Danny Boyle 1996 hit film Trainspotting. The first two albums they recorded together were with the band 'Freur'. The singles discography of British musician/singer-songwriter Elton John consists of 133 official singles and 17 as featured artist, as well as 47 other non-single guest appearances. Across his career, John has yielded 57 top 40 hits in the United States, second only to Elvis Presley in total, with 27 of those hitting the top ten and 9 achieving number-one. In his native United Kingdom, he has accumulated 69 top 40 singles, including 32 top tens and 7 number-ones. In 1997, John released the double A-side single "Something About the Way You Look Tonight"/"Candle in the Wind 1997" in dedication to the memory of Diana, Princess of Wales. It subsequently hit number-one in every country that it charted in and became the biggest selling single of all-time since the UK and US charts began in the 1950s, with sales of 33 million. John has sold 100 million singles worldwide. The discography of Australian rock group, Divinyls, consists of five studio albums, 26 singles, 6 Compilation albums and one video release. The solo discography of Belinda Carlisle, an American pop singer-songwriter, contains eight studio albums, nine compilations, eight retrospective box sets and four video albums. Her singles discography features thirty-two physical releases – three of which she has recorded as a guest artist –, four digital-only and five promotional releases. She has also made nine other appearances and thirty-one music videos. American singer Debbie Gibson has released nine studio albums, five compilation albums, thirty-five singles, three video albums, and twenty-one music videos. This is the discography of Violent Femmes, a Milwaukee, Wisconsin-based alternative rock group, which consists of eight studio albums, nineteen singles, four live albums and four compilation albums, in addition to a number of miscellaneous appearances on soundtracks and compilations featuring various artists. This list does not include solo material by any of the bands' members. American rock band Aerosmith has released 76 singles. Some of their singles have been officially released to the public, while others have been released as album cuts only to radio. 21 of their songs have reached the Top 40 of the Billboard Hot 100 and the band has long been a stalwart of the Mainstream Rock Tracks chart, achieving nine #1 hits on that chart to date. An additional 28 of the band's songs have reached the Top 40 on various charts worldwide. This article presents the discography of American pop singer Michael Bolton. Since 1975, Bolton has released 17 studio albums and 35 singles. Nine of Bolton's singles have peaked at #1 on either the Billboard Hot 100 or the Hot Adult Contemporary Tracks charts in the United States. Bolton has sold over 75 million albums and singles worldwide. Kim Wilde is an English pop music singer-songwriter. Her discography consists of fourteen studio albums, four compilation albums, one remix album and fifty-five singles. The discography of American rock band Collective Soul consists of nine studio albums, one live album, one compilation album, one extended play, thirty-three singles and twenty-two music videos. This is the discography for American pop singer Tiffany Darwish. The discography of Mark Denis Lizotte, an American-born Australian singer-songwriter. He has won five ARIA Music Awards with three for 'ARIA Award for Best Male Artist' in 1993, 1994 and 1995. The following is a complete discography of every album and single released by New Zealand-born Australian rock music artist Jon Stevens. The discography of Australian R&B and Pop music recording artist Marcia Hines consists of fourteen studio albums, one live album, nine compilation album and forty-one singles. The discography of Nigerian-born, Australian rock singer-songwriter James Reyne. 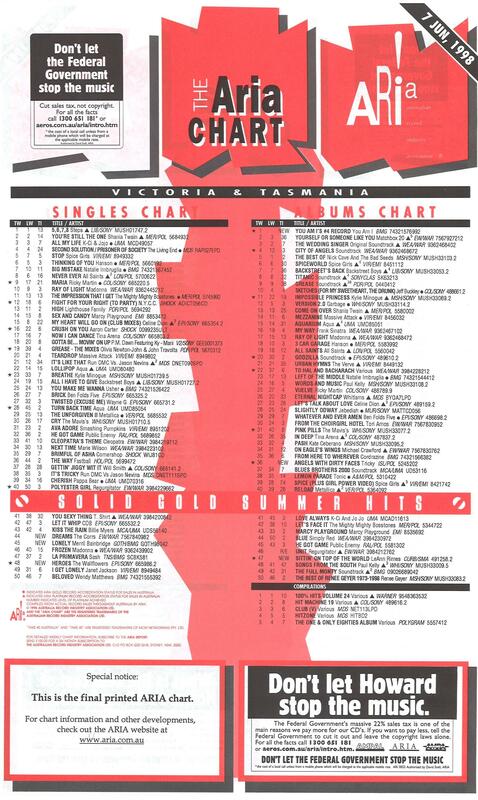 ↑ "The first ARIA top 50 singles chart (Countdown, 3rd July 1983)". YouTube . Retrieved 19 December 2015. ↑ Scott, Gavin. "30 Years Ago This Week: June 26, 1988". chartbeats.com.au. Retrieved 24 March 2019. ↑ Scott, Gavin. "30 Years Ago This Week: July 2, 1989". chartbeats.com.au. Retrieved 24 March 2019. 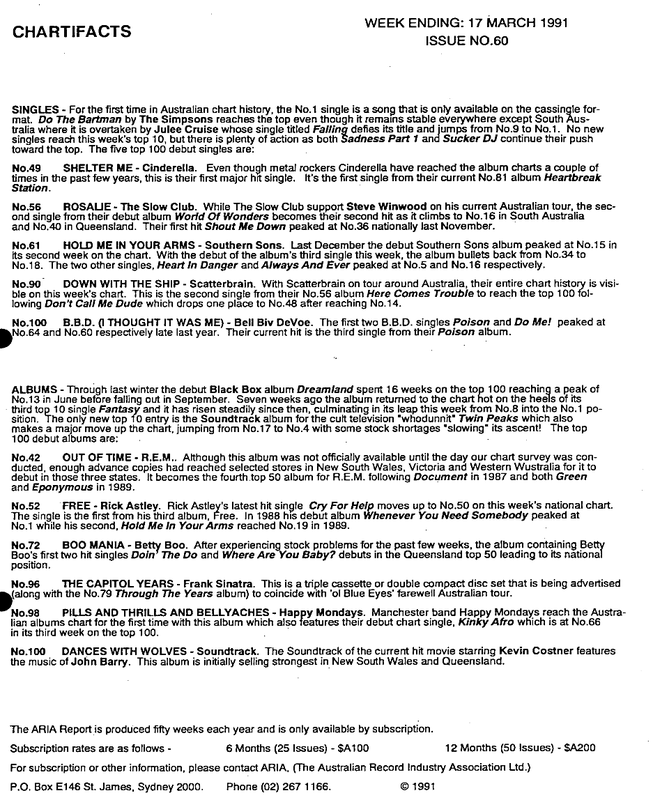 ↑ "The ARIA Chart 7 June 1998 (Victoria & Tasmania State Chart)". Imgur . Retrieved 29 December 2015. ↑ "ARIA Chart Stores". Australian Recording Industry Association. Archived from the original on 14 December 2012. Retrieved 30 December 2013. ↑ "Undercover - Your Daily Music Fix". Archived from the original on 4 September 2006. Retrieved 6 November 2006. ↑ "Brazin Data Returns To Aus Charts". Archived from the original on 13 January 2009. Retrieved 12 December 2006. ↑ "Australian Record Industry Association". www.aria.com.au. 1 2 3 "Take 40, Top 40 Countdown Australia, Music Charts". ARIA Charts. 4 April 2016. Archived from the original on 16 April 2016. Retrieved 12 April 2016.